Main components of the final natural gas price for the consumers are natural gas price itself, special additional levy, transportation cost and value added tax. Information on natural gas price in Ukraine in 2015 for different types of consumers is presented below. 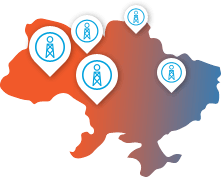 The level of natural gas price for industrial consumers not including special additional levy, transportation cost and VAT is approved monthly by National Commission for State Energy and Public Utilities Regulation of Ukraine taking into account imported natural gas price and national currency exchange rates fluctuation. Special additional levy in accordance with the Tax Code of Ukraine is temporary charged till the 1 of January, 2016. For the natural gas supplied to industrial consumers the levy rate is established at the level of 2%. Transportation costs consist of three separate charges for the natural gas transportation, namely the payment for the transportation by main pipelines, transportation by distribution pipelines and payment for natural gas supply. Starting from April, 2015 the total average natural gas transportation cost increased from UAH 414,6 per 1000 cubic meters to UAH 746,50 per 1000 cubic meters. Transportation cost could differ depending on the region. The changes in final natural gas price for industrial consumers in 2015 are reflected on the diagram below. Thus, the current natural gas price for industrial consumers in Ukraine is UAH 9708.6 per 1000 cubic meters or USD 424 per 1000 cubic meters. For the enterprises generating heat energy the price for natural gas since 1 of April, 2015 increased from UAH 1309,20 per 1000 cubic meters to UAH 2994,30 per 1000 cubic meters (USD 131 per 1000 cubic meters). This price includes special additional levy, transportation cost and VAT. 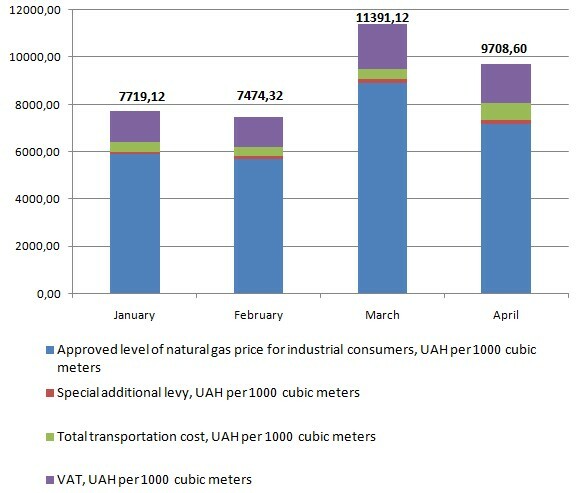 Starting from 1 of April 2015 the price of natural gas for households (including VAT, special additional levy of 4% and transportation cost) is established at the level of UAH 7 188 per 1000 cubic meters (USD 314 per 1000 cubic meters). In case of natural gas consumption for individual building/apartment heating purposes a special discounted price of UAH 3600 per 1000 cubic meters (USD 157 per 1000 cubic meters) will be charged for the volume of 200 cubic meters monthly during the heating period (October-April).